Hot tubs were once thought of as an extravagant purchase only made by the wealthy. This is understandable when you consider the prices of fixed hot tubs, which can easily cost several thousand pounds, something that not many can afford. With inflatable hot tubs now widely available, it is possible for more people to enjoy the comfort of a hot tub without having to pay thousands of pounds. Available for a fraction of the price, inflatable hot tubs are a great addition to any home. Not only are the affordable, inflatable hot tubs are easily stored away when not in use, and they can be set up in many locations unlike their fitted counterparts. Plus, nothing can be quite as enjoyable as kicking back in a warm hot tub after a long day. An inflatable hot tub should always be easy to set up. Nobody wants to spend hours trying to get their hot tub up and running, which can often be the case with some models. So, it’s always good to look for something that can be up and running with relative ease. Remember, inflatable hot tubs take a few hours to fill with water, while heating the water takes anywhere between 12 and 24 hours, so it helps to have a product that can be set up in around 10-20 minutes. Knowing what features to look for in an inflatable hot tub is easier said than done. You might not know what size you need or if there are certain features you should want with your tub, so knowing what to look for makes all the difference. Arguably the first thing to consider when looking for an inflatable hot tub is its capacity. The larger the hot tub, the more people it holds, so make sure you know how many people you would like to fit into the tub at any given time. Typical capacities are 2-4 people and 4-6 people for inflatable hot tubs, the latter of which is probably the best option to go for. This is because they offer much more space, which is great for holding more people or having plenty of room when fewer people use the tub - the last thing you ever want is to wish you had went for the bigger size! Plus, prices for larger capacities aren’t much higher, making it a very worthwhile investment. Given the fact the hot tub is inflatable, it is important to look at the overall build quality of the product. Those that are poorly made or use low-quality materials aren’t likely to last long, while certain construction methods may result in an uncomfortable tub. For instance, tubs built using I-Beam construction tend to have the highest build quality, as those made using horizontal ring methods aren’t the most stable to sit against. I-Beams result in a much sturdier build, allowing you to comfortable sit against the tub without fear of tipping the sides. Just like normal hot tubs, inflatable hot tubs come with jets that produce the bubbling effect for the water, making it much more relaxing to sit in. As a key feature, you want to get the best jets possible in your inflatable hot tub, and there are two options to choose from. Micro air jets offer a pleasant bubble effect, being found throughout the base of the tub, usually ranging between 80 and 120 jets depending on the model. Hydro jets are much more recent innovation, offering powerful jets that can be moved and adjusted to different pressure levels. This is great for getting the perfect jet setting in the tub, while the jets also provide a massaging effect to get you even more relaxed. However, as a much newer type of jet they do run the costs up quite a bit, so take this into consideration. Inflatable hot tubs feature a filtration system for maintaining clean water. These systems do need a fair amount of maintenance including regular cleaning, while they will eventually need replace, while you will also have to add chemical cleaners to keep the water disinfected. There are several hot tub cleaning kits available that give you everything you need to clean your tub and its filter, although these are always separately. Another option is to go for a more advanced filtration system. For example, salt chlorinator systems are built-in filters that do most of the cleaning. Simply add table salt, which is then converted into chlorinated water that maintains the tubs, keeping water disinfected and safe to use. These tend to cost more, but as they do make cleaning the hot tub so much easier, many people are more than happy to pay a little extra for such as handy feature. There are a few notable features that while not necessary, can make your inflatable hot tub even better. For example, many come with built in light systems to create a nice and relaxing ambience, while others include timer controlled heating systems. This feature is quite impressive, as it allows you to set a specific time for the heating system to kick in, which is a great way to reduce running costs. The reason for this is that most people tend to leave the heating system on even when the tub isnt being used at that time, as it takes some time to heat the water. Many decide to turn the heating system down a few notches when not using it, usually in the morning, cranking it back up later in the day when they plan to use it. Time controlled heating systems remove the need for this, as you can set the precise times for the system to activate and heat the water in time for use. Now that you know what to look for in an inflatable hot tub, you should have a better idea of what products might be worth investing in. Take a look at some of the best inflatable hot tubs currently available below! Lay-Z-Spa are perhaps the leading manufacturer of inflatable hot tubs, offering a range of exceptional products with competitive prices. The Pam Springs Hot Tub Spa is no exception, and could even be their best model to date. A spacious 4 to 6-person capacity provides ample room even with six people, so when your relaxing yourself it certainly offers plenty of space to unwind. The walls are nice and high too thanks to the I-Beam design, resulting in a more spacious tub that you can easily rest against. There’s no need for a professional installation as the hot tub is easy to setup, taking around ten minutes to get up and running, although it may take a little longer the first time if you’ve never used an inflatable hot tub. Simply find a suitable space to sit the tub, lay it out flat and then let it inflate itself. After this, just fill with water and wait for it to heat up. As the model comes with a rapid heating system, the water becomes warmer much quicker than most other models. Once warmed, you can immerse yourself in the amazing 40°C water while the 120 all-surrounding air jets offer wave after wave of relaxing bubbles. Should you want to adjust the setting, the digital control panel makes it very easy to do, with various temperature settings available and the ability to adjust the air jet settings. Better still, this digital control panel also includes a controlled heating system that allows you to set the heating system to a preferred schedule to keep costs down. The Intex Octagonal Pure Spa is a fantastic four-person inflatable hot tub. Despite being a four-person tub, it still offers plenty of space, with four people sitting comfortable without feeling too packed together. With 120 heated bubble jets and a temperature range of 20°C to 40°C, the Pure Spa offers the perfect amount of relaxation, which can be easily adjusted to suit your preferences! The heating system is great, warming the water in impressive speeds of around one Celsius per hour, while the insulated lockable cover and ground cloth work together to retain heat. Using the control panel to adjust settings makes the Pure Spa very simple to operate, while carry handles allow for easy transportation throughout your outdoor space. It’s also a very durable hot tub too. One of the biggest concerns with inflatable hot tubs is the durability of the materials, but thankfully this isn’t an issue as the Pure Spa is made from a puncture-resistant 3-ply laminated material. A built-in hard water treatment system also ensures the water in the tub is of the highest quality, making it gentler on both the skin and the hot tub itself. There are also two filter cartridges to help keep water clean, although a suitable chemical cleaner will be needed too. Furthermore, the inclusion of durable fibre-tech results in a very stable tub. You don’t need to worry about leaning on the edge of the tub and causing it fold in on itself, with a stable yet comfortable surface provided. 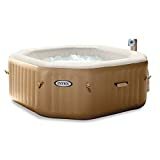 Another great product from Lay-Z-Spa, the Vegas Hot Tub is a fine choice for anyone seeking a larger inflatable hot tub for an affordable price. With a maximum capacity of six, this is an ideal tub for families or people that love entertaining guests, providing ample room to relax in comfort. A timer controlled heating system makes warming the hot tub simple, as you can adjust the activation and deactivation times to suit your needs. The total temperature is 40°C, which can also be adjusted using the digital control panel, so you can find that perfect setting to unwind in. Better still, the 87 air jets spread throughout the Vegas Hot Tub guarantee the upmost comfort, with the invigorating massage system taking you to new levels of relaxation. These are amazing for soothing any aches or pains you have, although you certainly don’t need to be sore to appreciate them! It also comes with a few extras to make things that bit easier. For instance, there are two filter cartridges that are used in the filter housing unit, filtering the water so that it is clean and clear. Remember, chemical spa cleaners are also necessary for maintaining healthy water, with Clearwater Chemicals designed to be used with any Lay-Z-Spa product. Another cool addition is the leatheroid cover with inflatable lid and the bubble mat floor protector. They both help to prevent heat escaping while protecting the hot tub, so it’s great to see them included - it just highlights how much value for money you get with the Lay-Z-Spa Vegas Hot Tub. Another popular model in their range is the Lay-Z Spa Miami. The Mspa Alpine M-009LS Inflatable Portable Hot Tub is a high-quality tub yet a very reasonable price, making it a fine choice for anyone looking for a large inflatable hot tub. Setting up the hot tub couldn’t be easier, with the auto-inflation taking around 2 minutes to inflate, so the total setup shouldn’t be longer than 20 minutes. The fill time is very impressive too, taking around an hour in total. As a spacious tub, six people can fit very comfortably, although fewer people have even more space, so it’s a fantastic option for anyone entertaining guests. The inclusion of I-Beam construction also makes it a very stable tub, so even when at full capacity there’s no concerns about the sides collapsing or the tub losing any shape. It’s also made from a highly durable Rhino-Tech 6-layer reinforced PVC material, so it’s a tub that’s certainly built to last. Perhaps one of the most impressive features is rapid heating technology. It’s notably faster than other models, heating water at around 1.2 to 1.8 Celsius per hour. This allows you to reach the 43C in a reasonable time, although the heat can be adjusted to the desired temperature if you want it lower. Furthermore, the 108 - 132 dynamic air jets offer a stream of bubbles throughout the base of the hot tub, which is easily adjustable using the control panel. This panel can also be used to activate the filter pump, heater system, and for setting temperatures, so you can easily operate every aspect of the Mspa Alpine M-009LS Inflatable Portable Hot Tub.